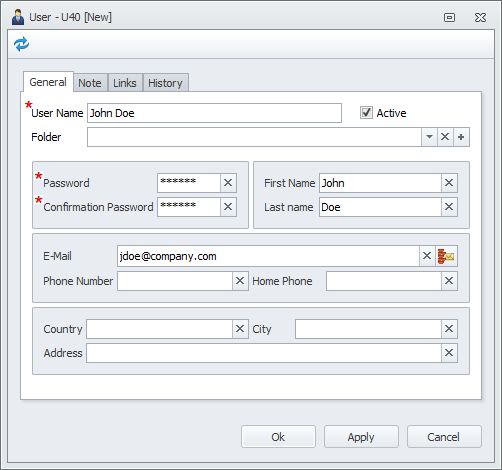 You can add users and groups to CentriQS database in either of the following ways. Note New users will log on to CentriQS database under user names and passwords that you enter while creating their accounts, while domain users added from Active Directory will log on under their domain user names and passwords. Log on to the database under Administrator account (username: admin, password: admin), click Go To, and then click Users and Groups. 1. On the ribbon, in the Data group, click Add, and then click User. 2. In the User dialog box, enter required settings, and then click OK. Note The User Name box, the Password box, and the Confirmation Password box are required. 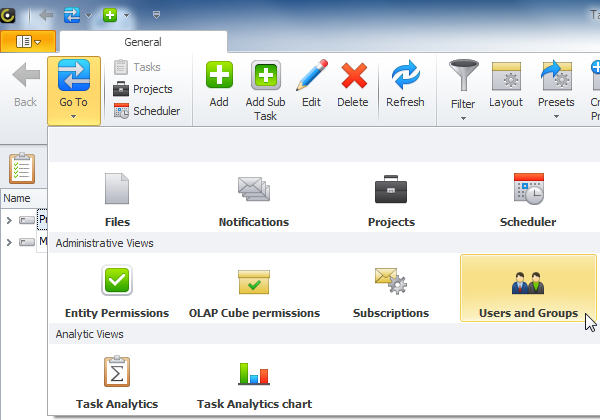 Note Users, added to the Users and Groups view, will be shown in such user lists as Task Owner, Assigned To, User Filter. 1. 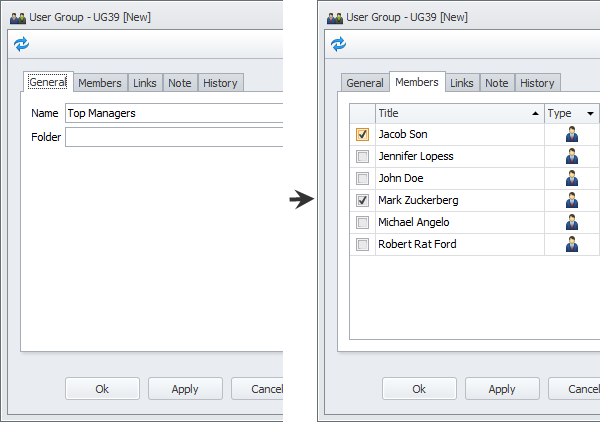 On the ribbon, in the Data group, click Add, and then click User Group. 2. On the General tab, enter the name of the new group; on the Members tab, select check boxes next to users included into the group, and then click OK. 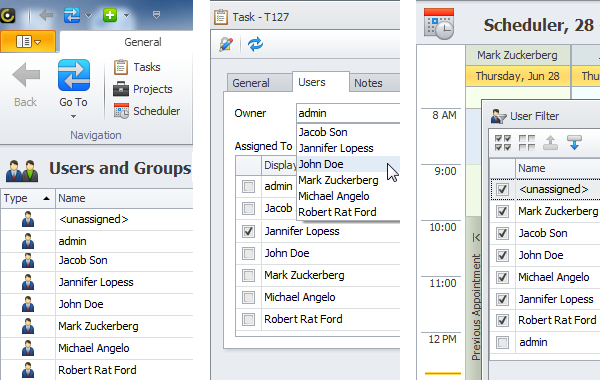 Note Groups are used to assign permissions to groups instead of users, whenever possible. 1. On the ribbon, in the Data group, click Add, and then click Domain User. 2. In the Add Domain User dialog box, in the Users/Groups list, click required domain user, and then click OK. Note If you add domain groups instead of domain users, domain users of these domain groups will be automatically added to all users lists, except for the Users and Groups view. 1. On the ribbon, in the Data group, click Add, and then click Domain User Group. 2. In the Add Domain User dialog box, in the Users/Groups list, click required domain group, and then click OK.